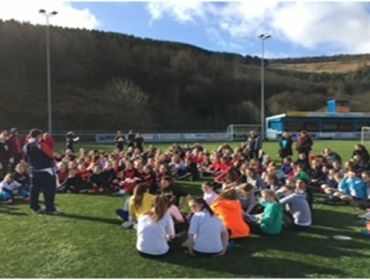 On the coolcrisp morning of March 4th, 2015, 200 highly-skilled young female playersfrom 17 different secondary schools across Rhondda Cynon Taff packed their kitbags ready to put all the weeks and months of training onto the field at theannual 5×60 girls football competition. This is always a highly anticipatedevent with winners gaining bragging rights, respect and the silverware for thenext 12 months. All schools had sent at least two teams forming fantasticcompetition for both younger (years 7&8) and older (9&10) teams. At 09:30 thefirst buses full of determined competitors started to arrive. A cold wind was swirlingaround the complex but the players didn’t seem to notice, nothing couldpenetrate their focus and suppress their desire to take home the gold. In theblink of an eye the complex was full; teams huddling together hotly debatingtactics, referees checking pitches with meticulous precision and a buzz ofexcitement surrounding the organizers as they watched all their hard work cometogether creating this spectacular event. At 10:00 am thefirst round of group matches kicked off and what a start! Schoolgirlsplaying with the confidence of seasoned internationals could only mean onething… goals! Lots of them! The group stages were atough contest for all and saw some close matches with many coming down to thewire. By nowthe sun was high in the sky and the wind had died down. This gave the perfectconditions for the drama that would follow in the form of penalty shoot outs.Crowds of volunteers, organizers, and fellow team mates lined the pitcheswaiting for the winners to emerge. The semi- final and final were no different.Closely fought matches and more penalties! Eventually the dust settled and the winners announced. After a hard day, GarthOlwg Community School came out on top of both categories claiming the doublewin. A competition ofthis caliber requires a facility to match. This was never going to be a problemfor the young players in Rhondda Cynon Taff. Cambrian’s FIFA standard 3G complexis perfectly positioned to allow easy access from all 17 secondary schools andwere more than accommodating. “We at Cambrian are more than thrilled to providethe young people in Rhondda Cynon Taff with a state of the art FIFA standard 3Gpitch. It is an absolute delight to see so many young girls keen to participatein the 5×60 football tournament held at out facility. 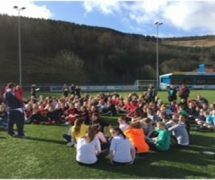 It was a day of healthycompetition, laughter and young players doing what they love!” (PhillipWilliams – Chairman of Cambrian Village Trust and Football Club). The innovativelay out implemented by the organizer meant that all areas of the ground werefantastic vantage points allowing 5×60 officers, Game On representatives andteam mates to support their players right on the sidelines. 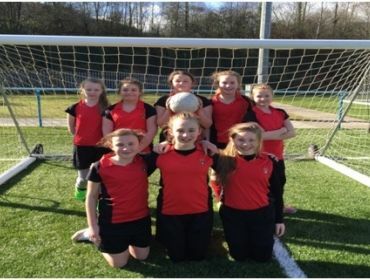 The primary aimof this event was to ensure the “fastestgrowing female sport in the world” (BBC Sport) was growing at the same ratein Rhondda Cynon Taff. The Youth Engagement and Participation Service have made ita priority to establish robust community links affording the young people inthe area fantastic opportunities to take sports which they have come to love throughthe 5×60 program further and push the boundaries of their ability. “Theamount of support we received from external bodies such as game on, TheUniversity of South Wales, Cambrian football club and Damien Flynn women’sfootball and development manager CCFC was nothing short of fantastic. Thisshowed the girls involved that there are clubs available for them within theircommunities.” (Rhys Rogers – 5×60 Officer and Competition Organizer). With theinvaluable support of the Game On initiative and volunteers from The Universityof South Wales the players attending this event were inevitably surrounded byexperienced coaches and officials that could point them in the right direction,give them advice ensuring they progress to the next level or simply lend ahelping hand. Girls were able to link with Damien Flynn, women’s football anddevelopment manager for Cardiff City Football Club. 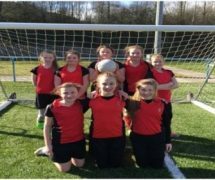 With many more hours ofhard work, training and competition they have the opportunity to progress into aCardiff City academy and become a professional footballer but, most importantly,a role model for young girls everywhere. This is just oneof many competitions Rhondda Cynon Taff and the Youth, Engagement andParticipation Service, along with the 5X60 officer’s, host in the community. We, asa dedicated team, will strive to provide the very best opportunities for allyoung people in Rhondda Cynon Taff and use sport as the driving force toequality and prosperity. No More Jobs Growth Wales?